As always, there’s a lot happening on the Old Mission Peninsula, and a lot of awesome people making things happen. Here are a few recent photos of your OMP friends and neighbors. 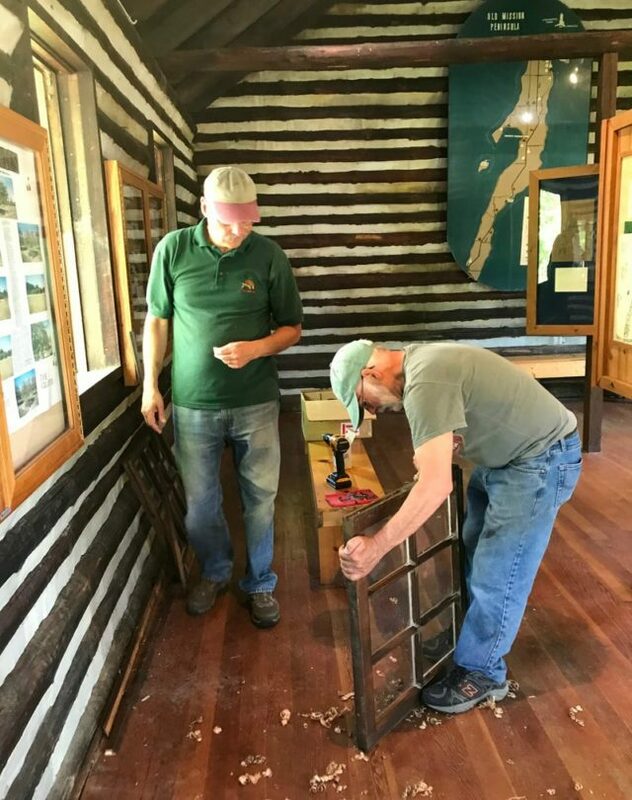 If you’ve noticed that the Old Mission Log Church (just north of Old Mission General Store) has been looking spiffy, the folks at the OMP Historical Society have been doing a lot of work on it lately. Here’s Chris Rieser and Marty Klein, replacing the newly glazed windows in the church. Check out the Historical Society’s beautiful new website here and consider joining this fun group. I’m a member, and the meetings are fun and educational, and you’ll learn a lot about the Old Mission Peninsula. OMP residents Curt Peterson and his wife Gussie recently bicycled from the Old Mission Peninsula to Portland, Maine. The photo on the left is at the beginning of the journey, dipping their tires into West Bay. On the right, 16 days and 2200 miles later, they dipped their tires into the Atlantic Ocean. Curt said they were joined by friends in Rochester, New York, and finished the trip with 12 people. Way to go, guys! 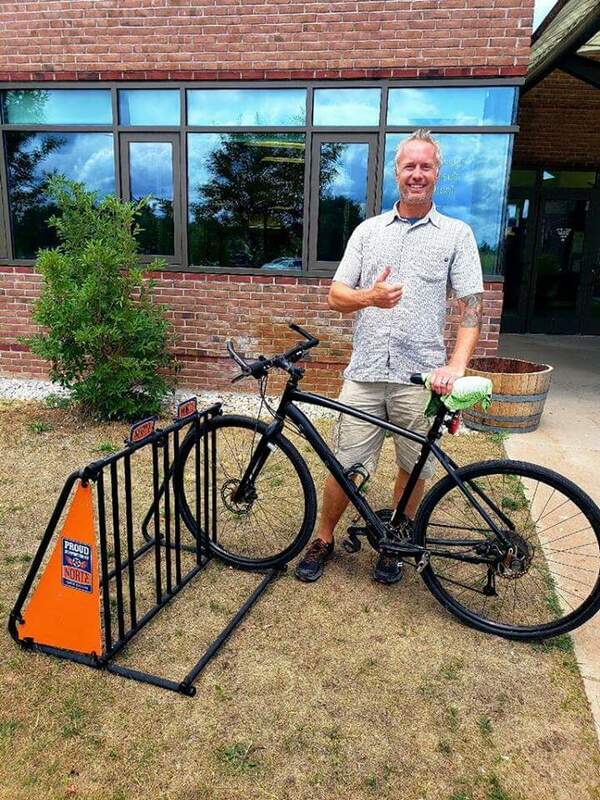 Why, yes, you CAN ride your bike to school on the Old Mission Peninsula. Here’s Jeremy Stringer, Director of Operations for the NEW Old Mission Peninsula School, opening for the upcoming school year on Sept. 4, 2018. Big thank you to Norte for the sweet bike rack, and of course, to everyone who is helping to keep our OMPS open and teaching kids into the future. 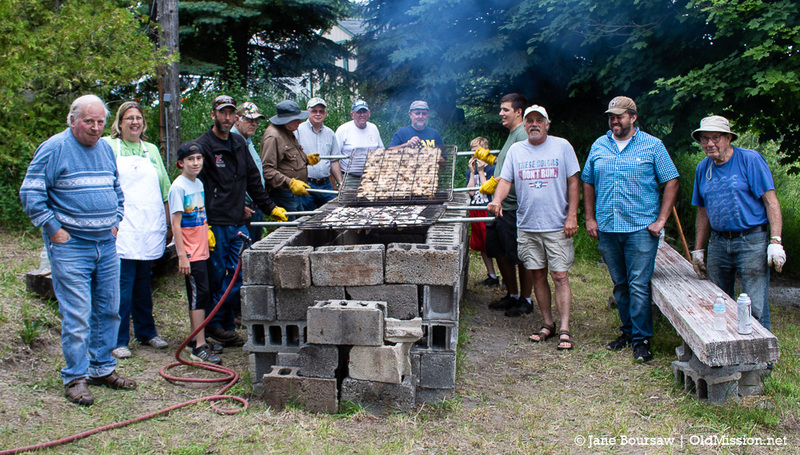 Here’s the “pit crew” at Old Mission Peninsula United Methodist Church‘s annual chicken barbecue. The event raised more than $3000 for the church, and a great time was had by all (except for the chickens – they sure were tasty, though – best ever). Church is 10:30 a.m. on Sundays, 16426 Center Road on the OMP (and you’ll get to hear me play my violin, for better or worse). And here’s a few guys from the Peninsula Fire Department, with Denny Olin at the OMP United Methodist Church Chicken BBQ. 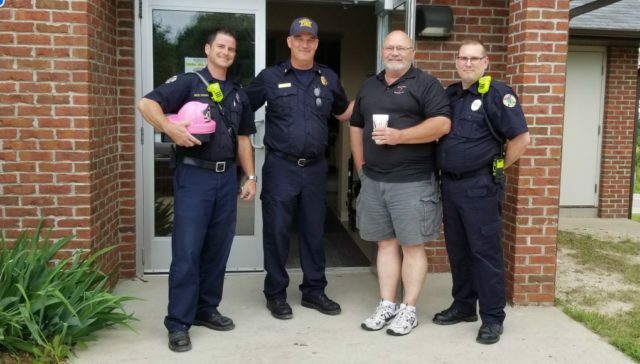 The Fire Department not only takes great care of our OMP community, but they love attending and participating in community events. That’s awesome. Here’s my annual summer photo of Sullivan’s Fruit Stand, run by lifelong friends Jim and Shirley (Cosgrove) Sullivan (that’s Shirley on the left). The wind had whipped the awning off the stand, but rest assured, they have a spiffy new awning since this photo was taken. 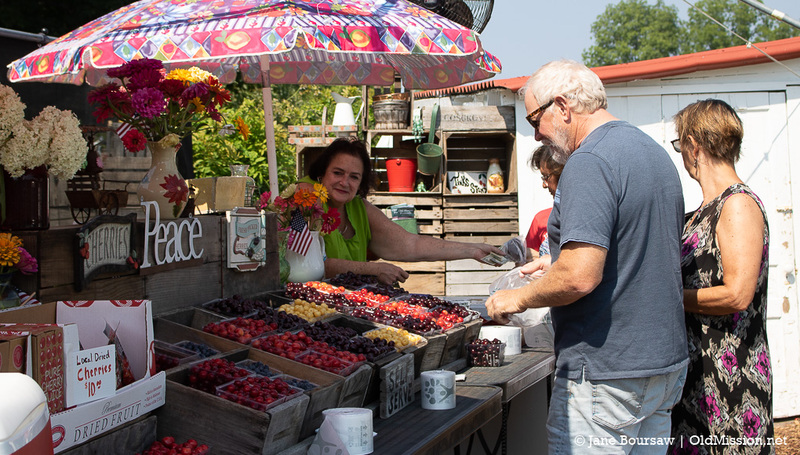 Stop by and grab some cherries and other farm produce (not to mention Moomer’s Ice Cream in the cooler!). They’re located on Center Road, just north of Mapleton on the left. It’s such a joy to see Little League kids playing ball at Bowers Harbor Park again. Big kudos to everyone involved with building the ball fields. 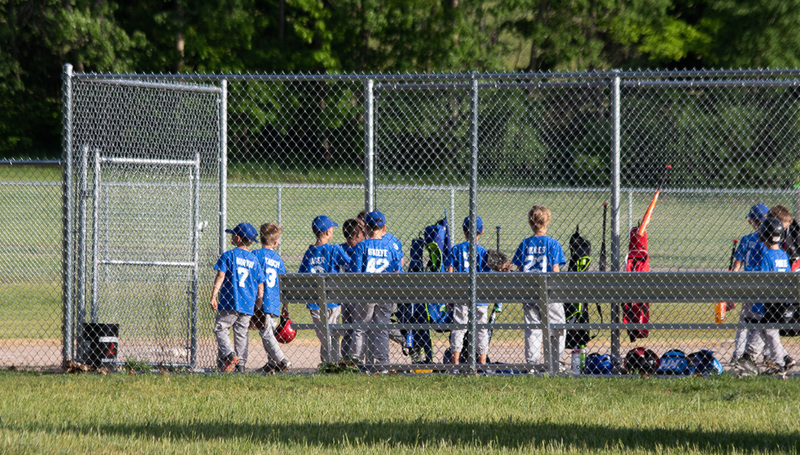 Here’s a few kids in the midst of a game. You know him as Johnny, the friendly bartender at Peninsula Grill. 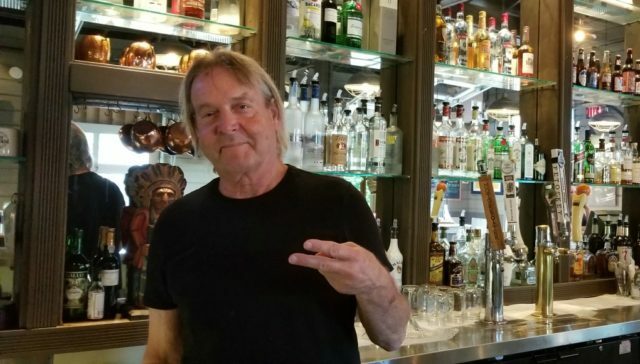 We know him as “Roke,” a guy we’ve known forever with a lot of stories we’re not allowed to tell. However you know him, John Rokos is definitely a cool guy and an OMP legend. 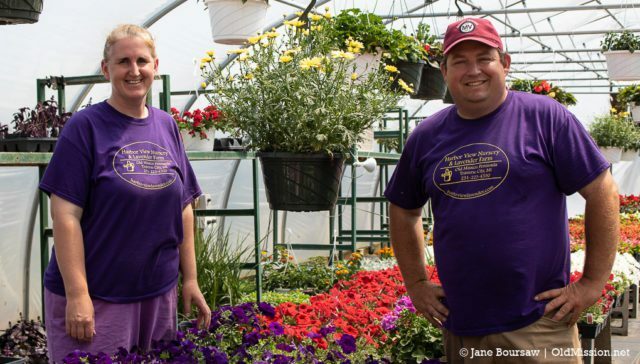 Have you stopped by Harbor View Nursery and Lavender Farm lately? They have the best flowers and gorgeous lavender, not to mention more than 50 really cool lavender products like soaps, sachets, candles, honey, lip balm and so much more. Stop by or shop their online store here. 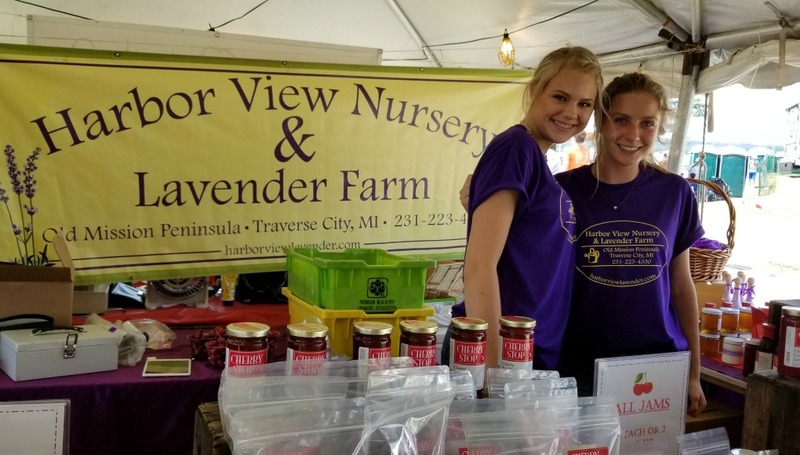 They’re located at 17770 Center Road on the OMP (the old Gleason farm for OMP old-timers), and they also have a store in Downtown Traverse City at 121 East Front Street, Suite 103. Here are the owners, Sonja and Bret Richards, who will be your instant friends the minute you meet them. And here’s their cutie-pie crew selling products at the Open Space during the National Cherry Festival this summer. We first reported on Kristen Abner’s devotion to raising money for the Leukemia and Lymphoma Society (LLS) through Team in Training (TNT) back in 2016. She’s still running strong and says she runs these marathons to “help spread awareness and knowledge, and also help with research funds, and patient and family aid.” Check out her Team in Training fundraising page here, and you still have a couple days to grab a Pyatt Brew at Mission Table/Jolly Pumpkin to help support Kristen’s current fundraiser. More info on her Facebook page here. 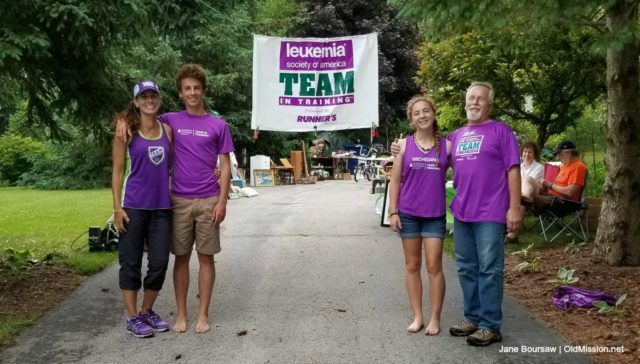 Here’s Kristen with her husband and kids (who also run). 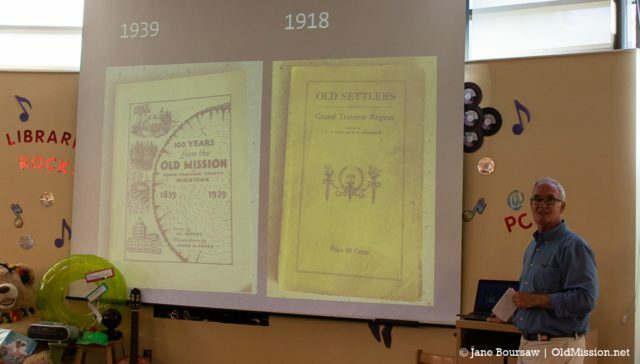 The Friends of Peninsula Community Library (learn how to join here) were delighted to have WTCM’s Ron Jolly give a presentation on his rare and vintage Michigan books collection, including many books centered on the Old Mission Peninsula. Big thanks to Ron for an entertaining and educational event at the library! And don’t forget to check out the library’s Summer Book Sale, running through August 8.